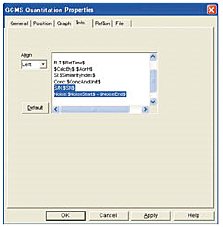 The quantitation browser allows the user to review multiple data sets in the same window. 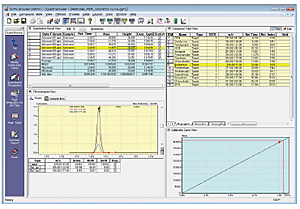 This allows checking the chromatograms and quantitation results from multiple samples with minimal switching between windows. In the analysis of pesticide residues in foods, if the residual level is very low and there is influence from the matrix, peak identification can be difficult. In order to facilitate identification, data from this program can be compared in parallel view with chromatograms obtained at the detection lower limit level and chromatograms of extraction samples with pesticides added. Together, this enables better, easier compound identification. In addition to GC/MS data, data obtained with GC detectors, such as PFDs and ECDs, can also be compared simultaneously. Conventional library search, making use of solely spectral similarity, often indicates so many probable candidates for an unknown that it is hard to identify especially in the case that sample includes isomers and much matrix. The GCMSsolution provides "similarity search with retention index", using retention indices registered in the FFNSC GC/MS Library Ver.1.3. This function makes it possible to perform more reliable and easier search even for complex samples. The results can be output as reports in electronic or hardcopy. * The FFNSC GC/MS Library Ver.1.3 can be used for the GCMSsolution Ver 2.4 or higher, or Ver 1.2 su1 or higher. The GCMSsolution Ver 2.4 or higher is required in order to use similarity search with retention index. The report format can be edited output into a blank report window sizes. Build your own custom report by choosing from a wide variety of items including chromatograms, spectra, spectrum search results, and quantitative analysis results. Or choose from a selection of template files for quantitative and qualitative analysis, and once a format has been determined, reports of the same format can be created simply by specifying the report file name. Macro functions that facilitate the display of required information on reports make it possible to produce a more diverse range of information. They can be used simply by pasting variables for items of information displayed in the help window into the property dialog boxes of report items.